The end of October isn’t just Halloween season, it is also midterm season. Here at The Campus Crop, we understand how stressful this time of the quarter can be. We all have our different ways to de-stress, but have you tried baking to relieve your stress? Ring in the Halloween season and take a break from studying by whipping up some of these adorably delicious baked Halloween treats! These adorable mini mummies are like pie in cookie form! This recipe gives you the option to make homemade pie crust or use refrigerated crust if you’re in a time crunch. If you love pumpkin pie and want to put a spooky twist on the fall classic, try this recipe! If you’re looking for a more minimalistic Halloween dessert, try baking these eerily elegant whoopie pies! Whoopie pies consist of two insanely fluffy, cake-like cookies holding together delicious cream. Make sure you have plenty of food coloring on deck for this dessert! If you’re short on time or are looking for an easy recipe, try out these brownie cauldrons! You can use a box brownie mix to save time and create these charming treats! This twist on the classic peanut butter cookie is a cute way to incorporate the Halloween spirit into your baking! You can top this cookie with a Reese’s or any other chocolate candy to resemble the body of your crawling critter! We know there’s much debate about whether candy corn is awesome or awful, but deep down, we know there is no taste that screams Halloween like this candy. 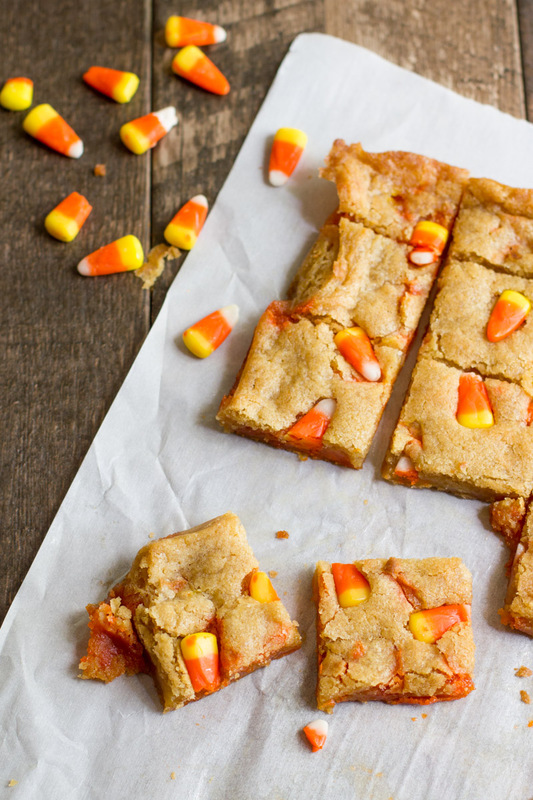 With these blondies, the candy corn melts as you bake it, creating a gooey and undeniably sweet taste you’ll love! Whether you hate the taste of pumpkin or just need a break from pumpkin spice everything, enjoy these cheesecake bars while still getting your fall flavor fix. These bars consist of a graham/oat crust, cheesecake middle layer, an apple crisp topping and a caramel topping. This symphony of fall flavors is calling your name! You can never go wrong with a sugar cookie, so why not mix it up and try these sugar cookie bars for a change? The ingredients are almost identical to what you would find in your average sugar cookie recipe. Just decorate with orange frosting and some Halloween sprinkles to keep the Halloween theme! What are some of your favorite Halloween treats to bake? Let us know by using the hashtag #CampusCropChat on Facebook, Instagram and Twitter. Don’t forget to follow us on Snapchat @ASICPP!